Thanks for visiting my blog. 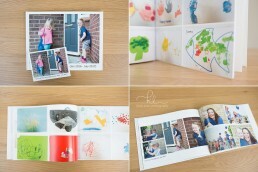 My name is Katie and I’m a photographer in Walton on Thames and mum to Sienna age 4 and Joey age 19 months. 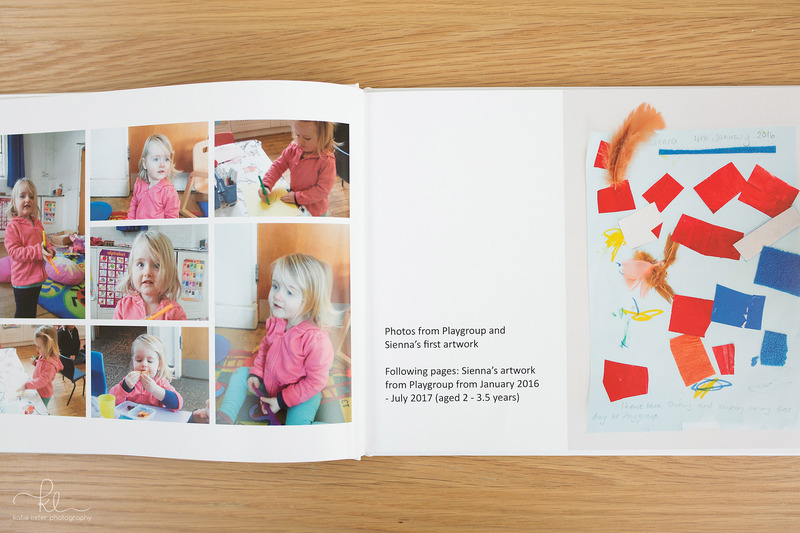 Do your children come home from nursery or school with reams and reams of artwork? My children sometimes return home with multiple paintings, drawings or other creations every day! Some of it is suitably impressive to warrant a space on the fridge or noticeboard, but what do you with the remaining (sometimes questionable quality!) creations? During my daughter’s time at nursery, I felt so guilty admiring her artwork and then subtly ‘filing’ it into the recycling bin after she had gone to bed. So instead I began started keeping it in a folder. Each piece she came home with was tucked away in a cupboard, out of the way but also not lost. My plan was to turn her artwork into a photo book. There are several companies out there who can complete this task for you, but it’s pretty simple to do yourself. I waited for a rainy day when my littlest was taking a long nap, and set about the task of photographing each artistic creation. I’ll be honest, it took about 8 months for me to find this pocket of time, but we all know what it is like getting around to those ‘rainy day’ jobs! I used my white kitchen worksurface as a neutral background and photographed each piece of paper from directly above. There were over 100 pages, and I’m not going to lie, my back was aching afterwards! I didn’t use my fancy camera – just a point and shoot (I have the Canon G7X). You could just as easily use your smartphone as the camera quality is so good on these phones now. Then I jumped online and browsed a few photobook websites to decide which one to use. I ended up selecting Bonusprint, as they had a 50% off deal and I’d seen their photobooks at friends’ houses and been impressed with the quality. I didn’t want to pay too much for the book but wanted reasonable enough quality, and I was really pleased with the output. 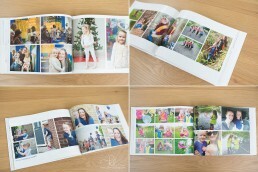 The software provided by Bonusprint for laying out the images in your draft book was really simple to use. So much so, that I decided to add some extras to my book. 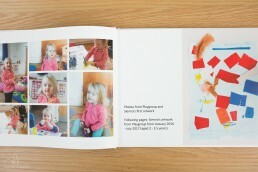 Instead of making it just about artwork, I also added photographs from my daughter’s time at nursery. 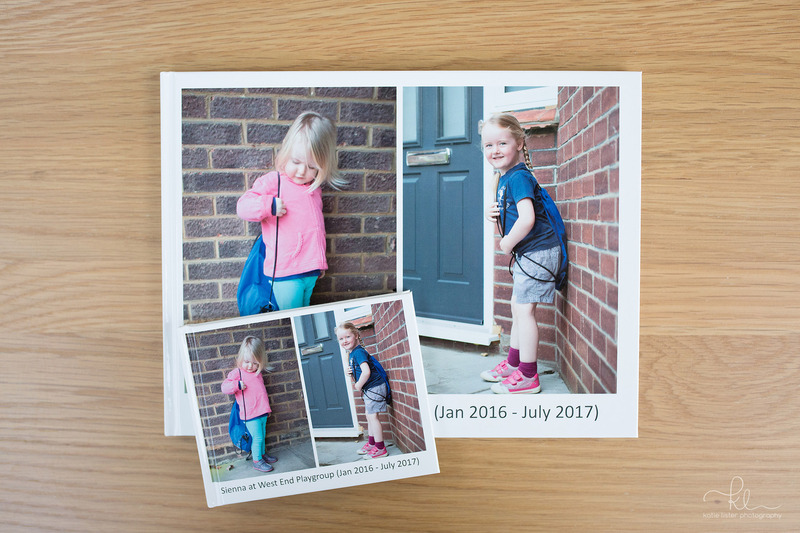 I had photographs from her first day and last day that I had taken myself, as well as photographs from activities where parents had been involved, such as the Christmas Nativity and Easter Egg Hunt. I also had a variety of photographs that staff had taken during her days there, and so I included these as well. I then got even more carried away and added scans of her reports, to make it a proper memory book of her time at nursery. 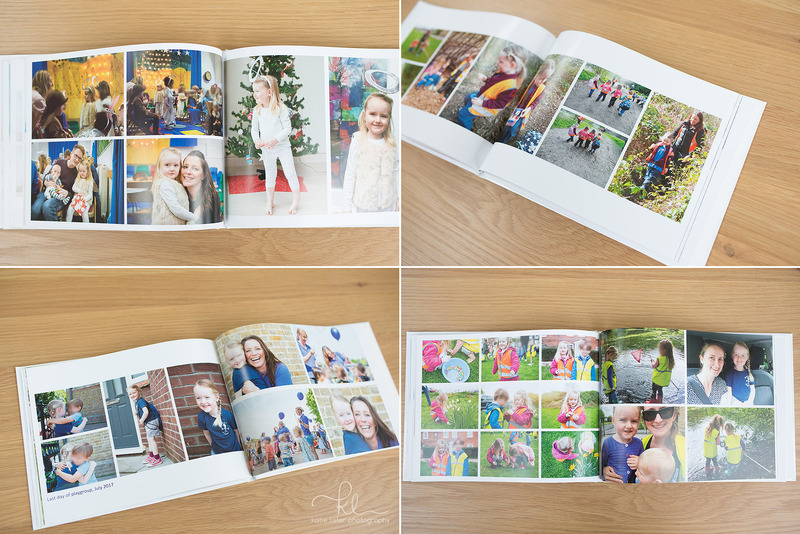 It’s unlikely that she will remember these days when she is older, so I hope that by creating this memory book she will have something to look back on in the future and show her children when they are this age! I ordered two copies, a larger size for me, and a smaller size for her to keep in her bedroom. She can look through this version without me worrying about my ‘best’ copy getting bent or ripped. 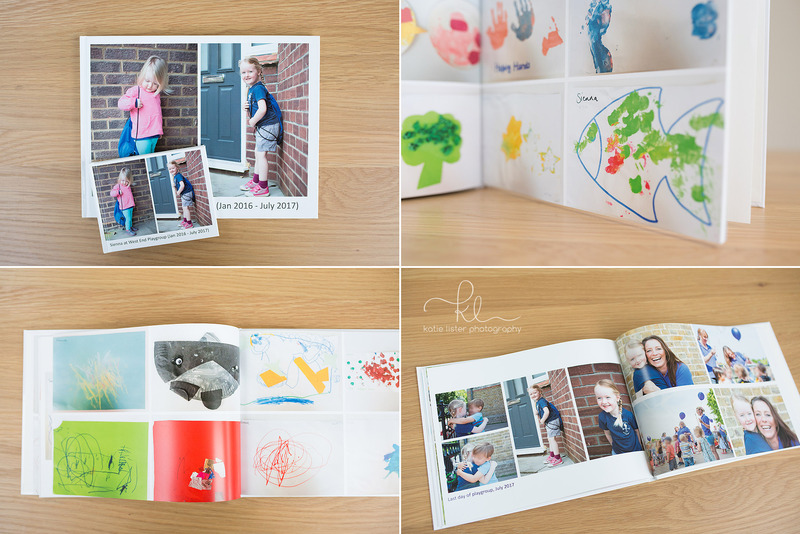 Turning the pages on our finished nursery memory book was really rewarding, and my daughter was really delighted to get her own copy to ‘read’. What was the most satisfying part of the process, however? Recycling all that artwork of course! I hope you enjoyed this example of how you can store and preserve your child’s artwork. If you have any questions please add a comment below! What a fantastic idea Katie! It’s so lovely to know that all your child’s creative efforts will be saved like this. Thank you Helen, I absolutely love looking back on it!